The Hawai’i Police Department joined forces with the Special Olympics Hawai’i during the "Tip A Cop" fund-raising event held in Hilo. 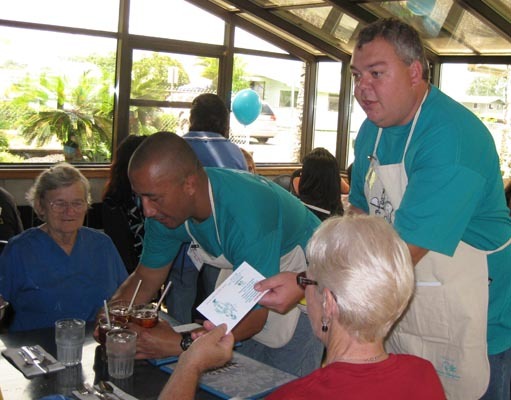 Off-duty police officers from East Hawaii volunteered their time and efforts for the annual fund-raiser in which they raised $3,605 during the event held at both Ken’s House of Pancakes and Don’s Grill July 13-17. Officers bused tables and served water to customers, who donated "tips" to the officers. All the funds generated during the event benefited Special Olympics Hawaii for East Hawaii athletic events. Police Chief Harry S. Kubojiri said the Hawaii Police Department continues to support Special Olympics Hawaii in its fund-raising events. "’Tip A Cop’ is a great way for the community to positively interact with our officers and see them in a different light as they give back to the merchants and people of the Big Island through volunteering," Kubojiri said.